Runbox acts as a domain reseller and registers and maintains most domains for customers through an accredited registrar. Registrars act as agencies for the registries that operate the various top-level domains (TLDs) such as .com, .co.uk, .eu and others. People are understandably concerned about who they give their personal details to, and prefer not to have their details passed to organizations in certain countries. Although domain privacy products exist, they only remove your details from the public whois databases, and do not prevent your details being stored with a particular registrar or registry. Runbox uses Enom Inc, based in the US, as our main registrar. Enom is GDPR compliant, which means that it adheres to the same strict privacy regulations that the EU does, when personal data is transferred from EU/EEA countries to the US. 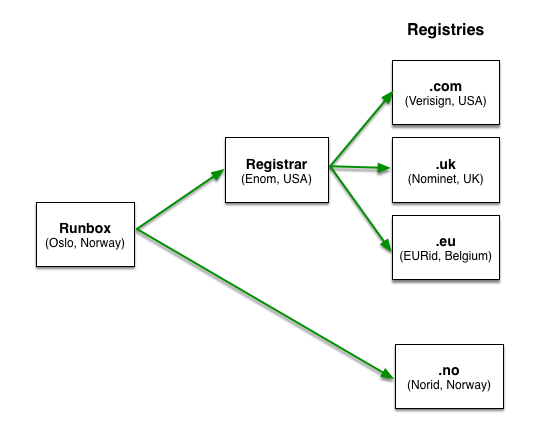 In the case of .no domains, Runbox is a registrar in its own right and registers these directly with the registry (Norid) that is responsible for these domains. The rules regarding the registration of .no domains is very strict and they are not available through the web interface. The diagram below shows how this works. As you can see from the examples in the diagram, your personal details must be shared by Runbox with the registrar and also the registry responsible for the TLD you are registering. Each TLD only has one registry, and so it is not possible to avoid your details being registered in the country where the registry operates. When a domain is registered, details of the domain owner are passed to a registrar and the registry that runs that particular top-level domain (TLD) such as .com, .uk, .eu and others. You also enter in to a legally binding contract with our registrar. Registries often make some details relating to a domain’s registration public (via a “whois” feature). With some domains this includes the full name, postal address, email address and telephone number of the registrant, whether they are a business or a private individual. In other cases only a name is shown, and in others only a contact email address is made available. Runbox is often asked if we can provide a list of domains where the registrar and registry meet certain privacy conditions. With the wide range of TLDs that exists, and with registries often outsourcing services to companies in countries other than the one the TLD belongs to, it is not possible for Runbox to provide a comprehensive list. Our domain registration interface will indicate whether a domain privacy option is available for a particular TLD that we support. In some cases it isn’t available and this might be because it is a requirement of that domain that your details are public, or it could be that it is not required because the registry doesn’t show the registration details for that domain anyway. Sometimes domain privacy is allowed for individuals but not businesses. A domain privacy option can replace some of the public personal data for a domain with generic data that belongs to an officially established domain privacy company. It is important that proper provision is made for domain privacy because just changing the registrant name on a domain to a fictional or incorrect name can have implications for the ownership of the domain (i.e. you may need to prove you are the owner at some point).